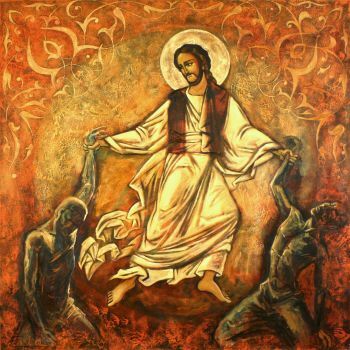 “It is like treasure … covered by blood because (of) what’s happening now, the sad events happening in Syria,” Neima told Catholic News Service in Washington, thousands of miles from his country, where conflict has killed nearly 200,000 people and dispersed about 10 million others, according to U.N. estimates. “After I lost my friend, Frans van der Lugt, I had the dream that there (are) quotes and patterns and a lot of drawing on a cave wall, and what I remember exactly (is) the wise, sad eye that was looking at me like blame, as if I should share this message,” he said. 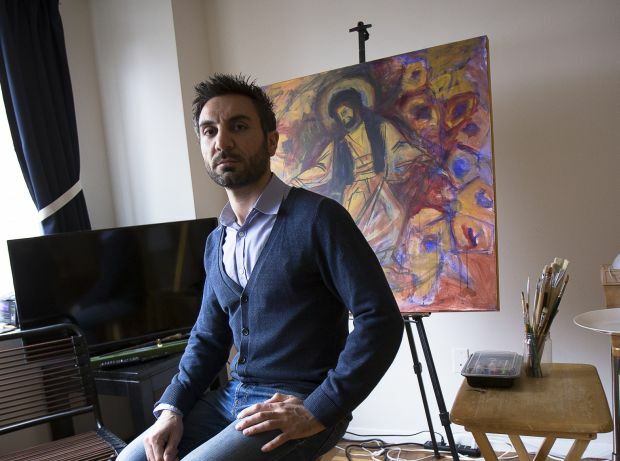 He said he hoped his paintings would encourage more Americans to stand up against the war and to learn more about Syria’s rich heritage and culturally diverse society, often overlooked in U.S. news outlets, which he claimed were simplifying his country’s conflict. “The Syrian society, when I was living there, was … a liberal society. It wasn’t like I support the extremists because I am Muslim, or like because I am Christian I will belong to so and so … there was not this category,” Neima said.